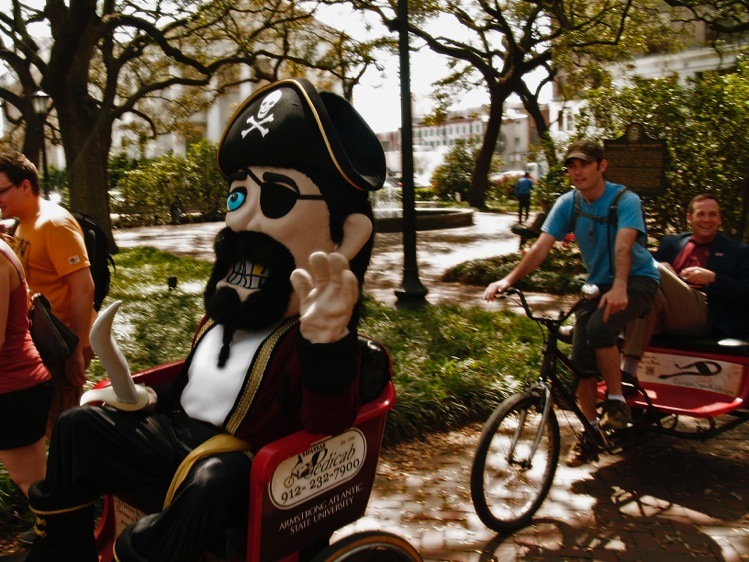 Captain George hitches a ride in Johnson Square. “Armstrong is my second family. I’m graduating in December and I have nostalgia because I am leaving my second family,” said Student Government Association President Andy Cabistan. “My first family is in Costa Rica, and Armstrong is a wonderful, wonderful place. It is more than an academic institution, it is a place where students grow as leaders and as a family,” Cabistand said on April 3 at the inaugural Paint the Town Maroon event. Johnson Square was decorated with maroon and white balloons, banners and supporters showing their pirate pride by wearing maroon T-shirts made for the event. Students, faculty, staff, alumni and other Armstrong supporters from around the community came together to celebrate beating the Commitment Fund fundraising goal of $850,000, one whole quarter ahead of schedule. Many in attendance, like Cabistan, had been impacted greatly by Armstrong at some point in their lives and were excited about the large numbers of scholarships and other opportunities that will be made available for future Pirates due to this fundraising success. The money raised came from many different fundraising events held by different organizations, as well as corporate and personal donations. Armstrong students have been doing their part fundraising for the Commitment Fund as well. In Cabistan’s speech, he addressed what students have been doing to raise money while also having fun. “This week at Armstrong was what we call Spring Fling Week. During this week we do many fun fundraisers to give back to the students and we had many organizations raising money. Out of all of the money that they raised, we will be giving half of it back to the Commitment Fund of Armstrong,” Cabistan said. The students raised over $900. Another group of people that have raised a significant amount of capital for this fund is Armstrong’s active alumni members. Andrea Turner, president of the Alumni Association, reported that the percentage of alumni giving back to Armstrong has gone up from 2 percent in 2012 to 5.6 percent in 2014. “That’s a tremendous, tremendous amount of growth,” she said. The increase in alumni support alone has made a huge contribution to the Commitment Fund and Turner hopes this is just the beginning of a steady increase in alumni members giving back. By reaching out to the Savannah community, Armstrong has not only received many substantial contributions to further better the institution but also formed friendships and partnerships with those responsible for making Savannah such a wonderful place to live and go to college. Bleicken says that it is now Armstrong’s duty to thankfully accept such generosity from so many people and put it to good use by offering students, who will continue to give back to Savannah for years to come, the best education possible.